Arizona Master Watershed Steward program participants sample macroinvertebrates in Tonto Creek, Ariz. Photo by C. Rupprecht. Researchers at the University of Arizona, led by Teresa Cummins, conducted an exploratory study on the online learning modules, designed to supplement hands-on classes taught by local experts and supported by an overview text, to help users increase their understanding of key concepts in the Arizona Master Watershed Steward program. They also sought to determine whether program participants would use the non-compulsory modules. Their evaluation revealed that module users increased their understanding of key watershed concepts; participants in the evaluation demonstrated a 30 percent increase in content knowledge following module use. Additionally, 70 percent of participants retained this knowledge through a two-month follow-up test. A follow-up survey showed that approximately half of the participants returned to the online modules on their own; several of these users returned several times and spent multiple hours per session. Comments from the follow-up survey suggested that the users accessed the site either as they had the time or as they needed the information. Online usage statistics indicated participants continued to visit the site for many months following the modules’ release and advertisement. Though many visits were very brief (a single pageview; only a couple of seconds), visitors with many returns to the site and/or long visits appeared to be working through the modules. 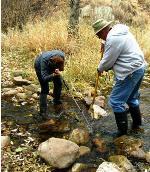 The Arizona Master Watershed Steward program, sponsored by University of Arizona Cooperative Extension, prepares adults to serve as volunteers in the conservation of water resources and the protection, restoration, and monitoring of their watersheds. The modules were intended to reinforce concepts covered in classes and further engage participants in the learning process. One key finding was that the modules were not clearly preferred by users over in-person instruction. One participant stated, “For me, they are just another avenue for learning, a supplement or additional reference. I prefer in person and real hands-on learning.” Other participants similarly expressed their desire for hands-on and face-to-face interaction. Several participants noted that that the usefulness of in-person lectures was a function of the presenter. Overall, the exploratory evaluation indicated that the modules were a welcome supplement to the course and were effective in reinforcing key concepts. Participants retained knowledge for several weeks, although since subjects were self-selected, they may have been self-motivated to pay attention and master the online module materials. The study was published in the 2010 Journal of Natural Resources and Life Sciences Education, published by the American Society of Agronomy, Crop Science Society of America, and Soil Science Society of America. The study was funded by the University of Arizona, Technology and Research Initiative Fund (TRIF), Water Sustainability Program.